Sport Pilot Ground School over the Internet is for pilots who want to review topics required for the Sport Pilot Knowledge Test (written test) with an instructor, without leaving home. Topics are presented in a limited attendee conference call and visual (PowerPoint) material delivered over the Internet. Small class size allows questions to be answered real-time as the material is presented. The classes can be taken anywhere there is access to both a phone line and an Internet connection. During each module, sample test questions are available and discussed, offering familiarity with the FAA written testing procedures. Once a module is taken, the student can attend that module again at no charge, space available. Modules are also available outlining the transition from Ultralight Pilot to Sport Pilot and for Private Pilots exercising Sport Pilot Privileges. The transition of an ultralight vehicle to Light Sport Aircraft is also covered. These introductory modules are of value to BFI/AFIs who are planning to instruct as Light Sport Instructors and CFIs who plan for instruct in Light Sport Aircraft. Make the most of the skills and knowledge already acquired and focus in on the areas that need review. As the powered parachute industry strives to standardize PPC training, SkyTrails Ranch, Inc. has completed the 3rd edition of their Powered Parachute Guide & Training Manual. This manual is a living, evolving composition of art, humor and data. The goal of the ‘Ranch’ (SkyTrails Ranch, Inc.) is to see this manual grow into a PPC Training Standard. All Instructors & personnel, who would like to see this sport improve its Training standards, and thus its safety record, are invited to add content to this growing document. The incentive for the manual was simply the Need for it. Years ago, when the ‘Ranch’ began its full-time, year-round powered parachute training program, there appeared to be a void of PPC information. Only one book (‘Rockin John Carr’s: "The Paraflight Experience" - now unfortunately 'out-of-print') was available to the public and Instructors to began to spread light, and thus insight into the powered parachute sport. So, the ‘Ranch’ began to research & document. And boy was the research needed. Both of the founders of the PPC course began (and completed) their individual training with "Don’t forget to turn off the engine when you land." No FAR 103 briefing, no wing kiting techniques, no flaring insights, no aerodynamics – well, you’ve got the picture. And perhaps many of you started out your PPC adventures in a similar muddled manner. SkyTrails Ranch offers the manual on computer CD or hardcopy (in loose leaf binder format – which is far better for adding new updated information). For Dealers and Instructors, that decide to use the manual as part of their own unique PPC training program, the CD can be created with the logo & pictures of the Manufacturer, Dealer or Instructor. Also, the opening, preface and introductory pages may be modified to ‘personalize’ the manual to the specific requirements of the Instructor, etc. As another convenience, the local training center can setup an annual payment system that will allow the local center to automatically receive updates, and the rights to locally print the manual, in order to save shipping, and to supply any immediate needs of the student. However, there is one warning that should be given with these training materials – the author’s sense of humor. Those of you that know Frederick Scheffel immediately understand this comment, and realize that his time during his formal education as a Psychologist may have been better spent at the local Comedy Clubs. And those of you that do not know him – well, be prepared to learn and laugh at the same time! Humor is thoughtfully placed throughout the manual’s 250+ pages of colorful, informative graphics and concise text. This humor is not just to place a smile on the reader, but to enhance and enforce essential PPC knowledge. Weather To Fly 2 For Sport Pilots with Paul Hamilton is a much needed instructional program on pilot weather and meteorology for light sport aviation and light sport aircraft including weight-shift trikes, powered paragliders, powered parachutes, and fixed wing 3-axis. The "Weather To Fly" system takes pilot capabilities plus aircraft limitations and weights them against the weather in the ultimate decision of "whether to fly". Flight instructor, Paul Hamilton, takes you through a simple step-by-step process that is easy to follow. You will learn about regional and local influences on weather in a straight-forward presentation. You will be able to forecast local conditions yourself and interpret weather information accurately to develop a clear mental picture of the conditions that may affect your flight. Time lapsed cinematography of cloud formations, in-air footage, and animation is used to simplify complex weather concepts, as well as, illustrate consequences of pilot judgement. After a brief introduction, you begin with "The Global Energy Engine - How the weather starts". This gives a global view of the hot and cold air masses, air currents, and weather patterns. This provides the basis for the "Big Picture" of weather and lays the foundation for your understanding of weather. Then you move to the "Weather To Fly" system. The 5 step process guides you in select appropriate weather conditions for safer and more enjoyable flights. Step One is "Information Resources Preparation". You learn where to get the best weather information. The internet site www.WeatherToFly.com is one of the great weather resources covered. In Step Two, "Observing your Local Weather", you learn how to observe conditions at your local site. The section on clouds, terrain, and wind provide the tools. Typical local characteristics for mountains, deserts, marine, and other types of terrain are discussed. The Sport Pilot 1-800 WX-Brief is also covered. In Step Three, "Whether to Fly? ", you learn how important it is to compare your aircraft limitations and pilot capabilities to the weather conditions. Physical condition, mental attitude, as well as, the pressure to fly from family, friends, and ourselves are discussed. Step Four, "The Flight", takes you through flight planning and pre-flight with the emphasis on weather considerations. You'll get some great tips on using your instruments, including your GPS, to measure horizontal wind and vertical air currents. Safety issues relating to weather are discussed. Finally, Step Five, "The Analysis" is where you compare your flight to the predictions you made prior to your flight. Here is where you learn how to develop your understanding of the air you choose to fly in. Making note of your observations and any trends or patterns for future reference helps you "get smarter each time you fly". Step 3 - WHETHER TO FLY? This program is packed with useful details with a comprehensive view of the basics and practical applications that you can use immediately. Expert pilots will be able to follow all points in their first viewing, while newer pilots may view it a number of times to full grasp all of the concepts. Our goal was to make this program beneficial for new, as well as, experienced pilots. "Weather To Fly 2 For Sport Pilots" is patterned after the original and highly successful "Weather To Fly - Basic Concepts for Flight with Dixon White", which has become the industry standard for ultralight and soaring pilots. 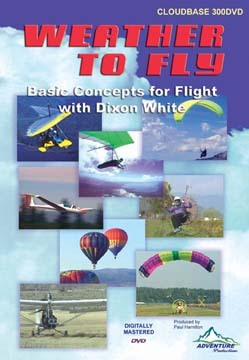 Dixon White of Dixon's Airplay Paragliding School located in Arizona and Washington State, as well as, Dennis Pagen, Author of "Understanding the Sky - A Sport Pilots Guide to Flying Conditions" were consultants on this project. Using the principles presented in Weather To Fly, you can make better decisions about "whether to fly". Track your flight history and educating yourself for future flights by having an easy reference to past conditions and the quality of the flight you had. See trends that you might not have seen if you hadn't had documentation. Try to "get smarter each time you fly". Area of Interest: For Pilots of any Light Sport Aircraft including weight-shift trikes, powered paragliders, powered parachutes, and fixed wing 3-axis. A much needed instructional DVD on meteorology. Dixon White, Master pilot and USHGA Examiner, and first Paraglider Instructor of the Year, takes you through a simple step-by-step process showing where to acquire weather data and how to interpret it. This program will help pilots of any aircraft understand more about modeling and forecasting. You learn about regional and local influences and how to determine winds aloft and stability. The Weather To Fly system take pilot capabilities plus aircraft limitations and weight them against the weather in the ultimate decision of "whether to fly". The 5 step process guides you in select appropriate weather conditions for safer and more enjoyable flights. You learn how to develop your understanding of the air you choose to fly in. Making note of your observations and any trends or patterns for future reference helps you "get smarter each time you fly". The Weather To Fly DVD is an over-all view packed with useful details and includes great cloud footage. It is a straight-forward presentation that is easy to follow. Time lapsed cinematography of cloud formations, in-air footage is used to simplify complex weather concepts, as well as, illustrate consequences of pilot judgement. WEATHER DATA - Learn where to acquire weather data and how to interpret it. This program is packed with useful details with a comprehensive view of the basics and practical applications that you can use immediately. Expert pilots will be able to follow all points in their first viewing, while newer pilots may view it a number of times to full grasp all of the concepts. Our goal was to make this program beneficial for new, as well as, experienced pilots. Using the principles presented in Weather To Fly, you can make better decisions about "whether to fly". Track your flight history and educating yourself for future flights by having an easy reference to past conditions and the quality of the flight you had. See trends that you might not have seen if you hadn't had documentation. Try to "get smarter each time you fly". Area of Interest: For Pilots of any Aircraft; Hang Glider, Paraglider, Powered Paraglider, Ultralight, Trike, Powered Parachute, Sailplane, and Balloons.